Two complete classis RPGs in one collection. 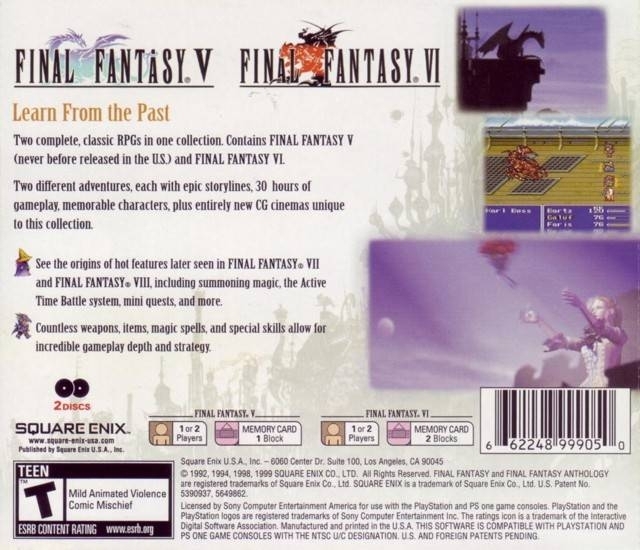 Contains FINAL FANTASY V (never before released in the U.S.) and FINAL FANTASY VI. Two different adventures, each with epic storylines, 30+ hours of gameplay, memorable characters, plus entirely new CG cinemas unique to this collection. 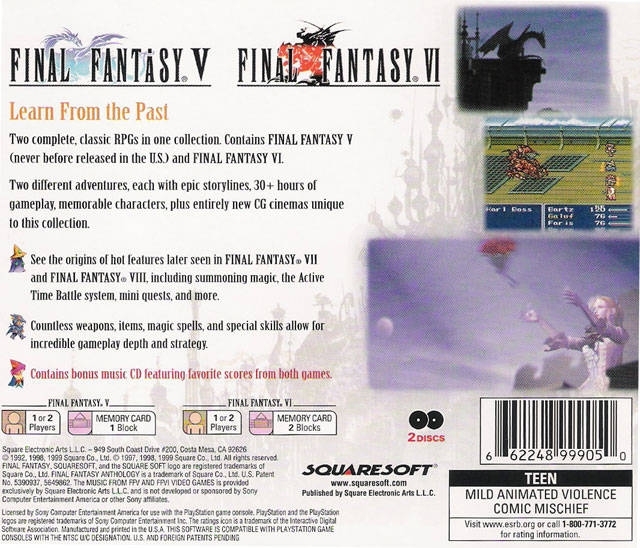 See the origins of hot features later seen in FINAL FANTASY® VII and FINAL FANTASY® VIII, including summoning magic, the Active Time Battle system, mini quests, and more. Countless weapons, items, magic spells, and special skills allow for incredible gameplay depth and strategy. Contains bonus music CD featuring favorite scores from both games. yup, i thought i was tricked when they gave me FFV only. 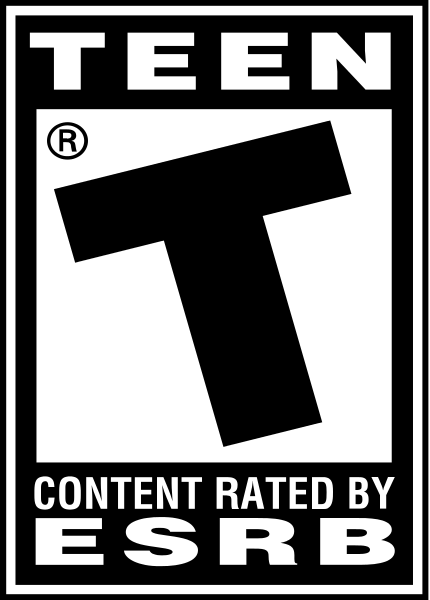 European version is IV and V, and VI was separate. 10/10 A must have for any FF fan and/or collector! 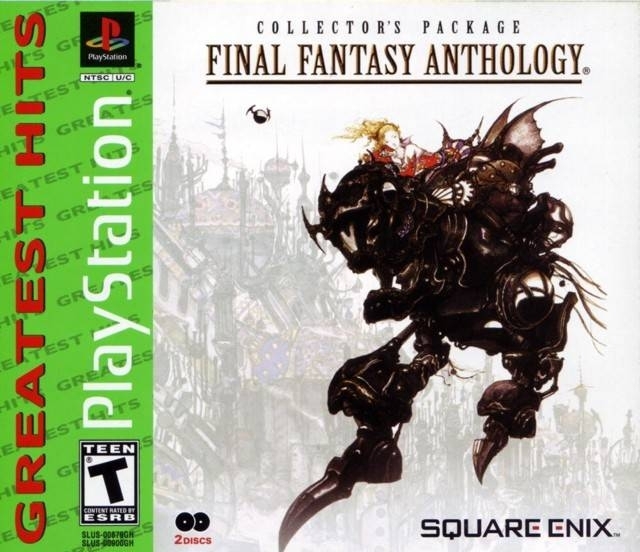 6 Is easily the best 2D FF game and still to this day, one of the best in the series. What a pity the European Edition didn't include V and VI; instead, it had IV and V. Still not a bad deal though - I only hope I'll find time to play these games :-/ And luckily I have VI as well (it was released seperately, you know).